This is one of my all time favorite wooden rings. It is a Bocote and Bubinga ring, made by laminating pieces of wood together to form a blank. The blank was then drilled, the corners cut off, and finally it was sanded to shape. It’s about 3/4″ tall, and stands out from other standard size rings. Bocote and Bubinga are great species to work with when making wooden rings. Both have a great look, and they go well with many other species. Bocote is a little more on the expensive side, but a single piece can last a long time. If you look around for one that has a really nice grain pattern, you will get a good piece for the price. Bubinga is less expensive that Bocote, and is available almost everywhere. It has become an alternative to tropical hardwoods, and has a nice density. Bubinga wears well, and has several color dimensions when you see a larger piece. What really makes a ring like this special is the process. 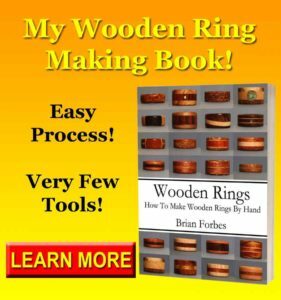 You can easily make wooden rings like this, and I cover the method in my laminated wood ring article. Once you discover laminated wood for your woodworking, it will improve everything you make. There is no real difference between making something from laminated wood over solid wood. The process is the same. The only small difference is the time up front when you are laminating your pieces. 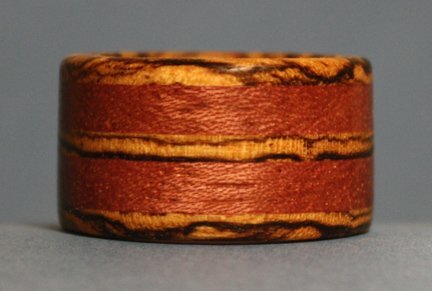 I still have this Bocote and Bubinga ring, and I have no intentions of selling it. I really like the look, and I think that something a little larger for a wooden ring helps draw attention. Most rings are very thin, and easy to miss. When you are wearing a larger wooden ring like this, you will be asked over and over about it. Anyone who wears a ring like this will love that feeling. shows this ring, as well as over 50 others. There are step by step examples for how to make them, and you do not need many tools. These make great gifts, and are easy to make. If you have any questions on my Bocote and Bubinga ring, please leave a comment and I will be glad to answer them. Also, please share my work with your friends on Pinterest! Happy building.